Savvy moms are constantly on the lookout for products that work overtime to make life easier on the go. That's why Munchkin created a unique functional bib that rolls into a carrying pouch when not in use! 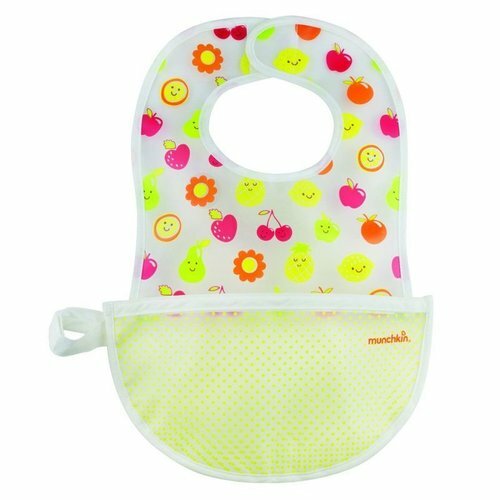 When being used as a bib, the pouch serves as a crumb catcher pocket, keeping stray food pieces away from baby's face and clothes. When not in use, the pouch can hold feeding utensils and also seals shut, keeping messes locked inside and not strewn all over your diaper bag. Bibs that do double duty? That's what foolproof baby feeding is all about.